RCIN 1121338 - Orlando furioso di Lodovico Ariosto ; tomo 1. The first volume of a lavish edition of Ludovico Ariosto's epic poem Orlando furioso, first published in 1516. 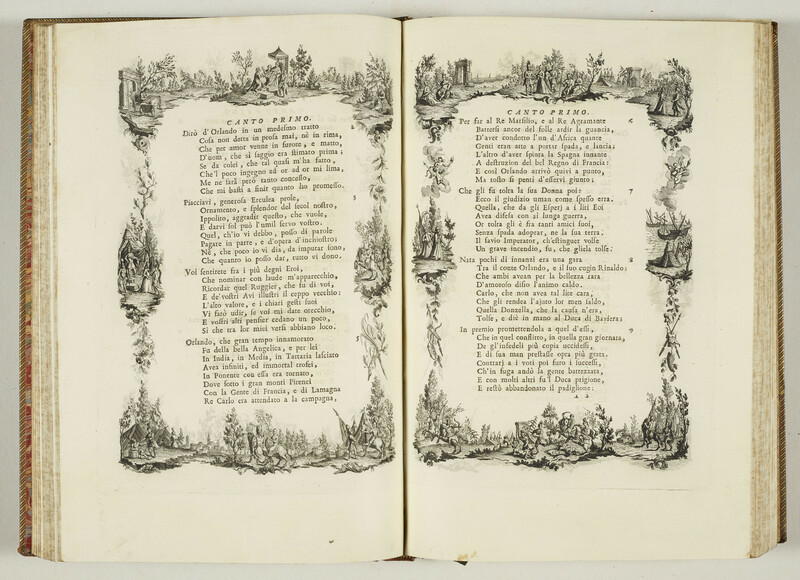 This edition was published by the Zatta press in 1772; every page has a decorative border, and each canto opens with illustrative plates mostly designed by Pietro Antonio Novelli (1729-1804) and etched by Giuliano Zuliani (c.1730-c.1814). The Zatta edition was the first press in several decades to issue the text with new illustrations. Such richly decorated editions of classic Italian texts were produced in eighteenth-century Venice to be sold to prestigious libraries across Europe. The edition is dedicated to John Stuart, 3rd Earl of Bute, one of George III's advisers, and was probably intended for the British market in particular. This copy is inscribed by Frederick Barnard, George III's librarian, and is stamped with the monarch's cipher; it must have been acquired for the King soon after publication.